Moose Boats rises to the challenge of building its biggest vessel ever. 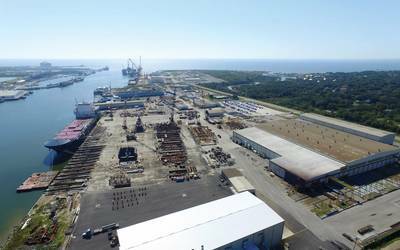 That’s an important step forward for this growing California shipyard. Equally impressive is what’s inside that rapidly developing hull and why those features were chosen. Moose Boats was founded in 2000 by Roger Fleck and, in a very short period of time, has delivered an impressive total of about 100 military, law enforcement and fire rescue vessels. 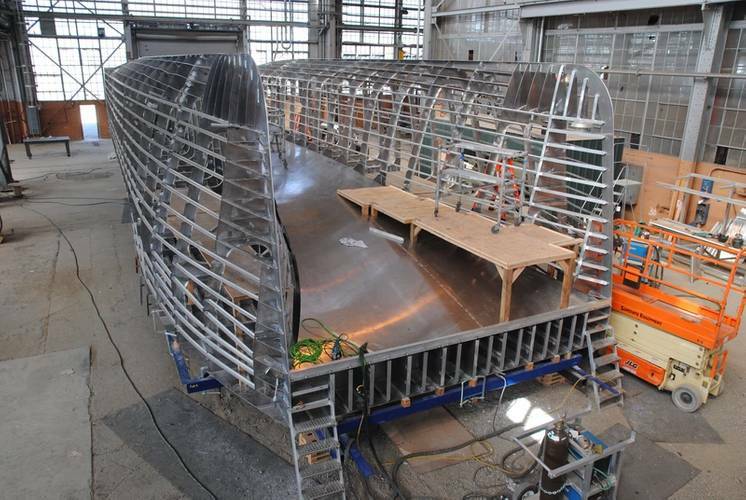 Moose Boat’s relocation into a larger production facility at Mare Island allowed the business to scale its production line to meet demand for larger aluminum vessels and offer a wider range of designs. The catamaran Moose Boats is currently building for Westar Marine Services in San Francisco – 75 feet LOA and 130,000 pounds of full displacement – is a perfect example of that evolution. With larger craft, such as the new catamaran Moose Boats is currently building for Westar Marine Services, the yard was able to leverage its internal design principles in a more spacious realm, with greater possibilities. The core philosophy of Moose Boats has always encompassed terms such as "form, function, practicality, seaworthiness, crew safety, stability, serviceability and maneuverability.” If so, then their biggest boat to date will provide all of that, and more, when it finally slips into the water in Q3 2019. Westar Marine Services sought out Moose Boats with basic criteria that called for crew boats to ferry personnel and ship’s stores to various destinations around San Francisco Bay. This demanded a hull capable of transporting 28 passengers and 20,000 pounds of palletized cargo with an integrated cargo crane. Westar’s existing crew boats are steel mono-hull designs with deck level pilothouses, sub-deck level crew seating and a service speed of around 10 knots. In addition, Westar’s existing boat engine compartment accesses were obstructed when a large amount of cargo was stored deck, leaving captains and deckhands with no direct access to crew cabins from the pilothouse. Westar has also been successfully running steel mono-hull crew boats with conventional propeller propulsion for decades and was understandably somewhat hesitant to change what was working for them. Hence, the initial design concept for Westar’s new vessels was a 65 foot aluminum mono-hull with conventional propulsion. Westar’s requirement for service speeds in the low to mid 20 knot range with EPA Tier 3 engines brought about the concept of investigating a high efficiency displacement catamaran hull form to satisfy both the performance and fuel consumption requirements. Employing Incat Crowther’s catamaran design expertise that advised a 70 to 75 foot high-efficiency displacement catamaran, Westar’s speed and load requirements were met. Various propulsion analyses were performed and eventually, water jets were ruled out due to their lack of efficiency in the 20 knot speed range. With a proven track record in Europe, and impressive reviews from U.S. East Coast pilot boat operators, Westar adopted Volvo Penta’s IPS system for its thrust, maneuverability and efficiency. Incat Crowther then specified the IPS 900 propulsion package, consisting of Volvo’s D13-700hp engines and IPS3 drives. The conservatively projected full load performance at 85% of MCR is an impressive 24.5 knots while limiting fuel consumption and engine stress. 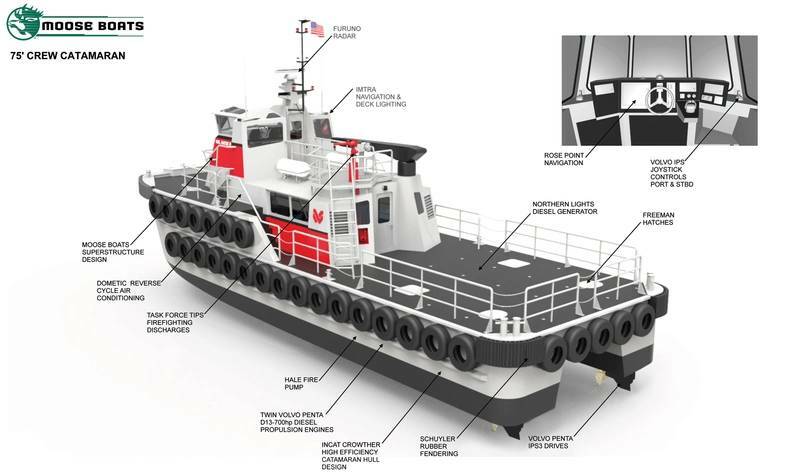 The shipyard design team then set out to capture the Moose Boats hallmark goals of an aesthetic, practical and functional workboat. As the design took shape, a new breed of crewboat emerged; one with a modern hull form and next generation propulsion system. The pilothouse has wrap-around dash supporting a Furuno TZ-touch 14” multifunction navigation display, climate control thermostats, Imtra wipers, Volvo helm controls, two Volvo wing station joysticks, Volvo engine, alarm and steering displays. Custom built Blue Sea Systems 360 switch/breakers will handle power distribution, Hella navigation lights and Imtra deck lighting. Hull: This adaptation of Incat Crowther’s proven hull form is specifically designed and optimized for Volvo’s IPS drive. Its hard chines and aft end shape have been developed to maximize flow to the drive units. Designed with high freeboard and tunnel clearance, it will cope well with offshore conditions. Propulsion: The twin Volvo Penta diesels with IPS steerable pod drives with forward-facing dual counter-rotating props make for a highly efficient propulsion solution for crew boats. Volvo Penta reports that IPS produces 30-40 percent longer cruising range, 15-20 percent higher top speed, 20-35 percent reduction in fuel consumption, 20-35 percent lower CO2 emissions and 50 percent lower perceived noise levels. IPS is also easier to install, taking about 50 percent less time than inboard shafts and is easier to service. The pods also provide higher torque and faster acceleration, as well as higher bollard pull of approximately four tons per pod unit. Connected directly to the engines, the IPS pods are further forward than inboard shaft drives, providing more interior space. Moreover, IPS provides safe and predictable boat handling in close quarters, especially with the joystick controls. Volvo Penta’s Power Center in San Francisco, Helmut’s Marine Service, will install and test the propulsion system. The IMTRA Package: IMTRA provided a number of features for this new build, including Frensch heavy duty interior LED utility and engine room lights; DRH navigation lights, IMTRA’s offshore series LED deck lights; and Exalto windshield wipers. The Frensch utility lights are extremely efficient, super high output, surface-mounted fixtures selected for their durability and compact form; ideal for engine compartments. The DHR LED navigation lights offer a unique commercial design with back-up LED drivers built right into the fixture and the ability to service the fixture onboard if needed. The Offshore series LED deck lights are specifically designed with the extra protections required to survive life on the open ocean and further provide the illumination needed to focus on the job at hand. Exalto wipers offer unmatched mounting flexibility, ease of installation, and are built to perform in the harshest conditions. The forward end of the pilothouse takes its design cues from the Moose Boats M2 catamaran’s cabin with the addition of a widened aft end allowing access to the foredeck via port and starboard doors and the aft station via a door on centerline. An internal stairwell provides access to the crew lounge, head and passenger cabin. The raised pilothouse gives Westar’s captains the sightlines they require while remaining narrow enough to not to come into contact with the counter of large ships during crew and cargo transfers. Additionally, it was decided that fewer deck level changes results in higher levels of safety for the crew. The final design allows for the transit from the helm to aft steering station without negotiating any steps. Similarly, the passenger cabin, head and crew lounge are all located on the main deck level, providing Westar’s deckhands and customers with enhanced safety and comfort. All of that, packaged with an impressive array of quality OEM components will, later this year, produce the workboat that Weststar has always wanted. Along the way, Moose demonstrated its ability to scale up to even bigger hull forms. And, that’s what’s really in this workboat.